Small business owners know having a website, social media and Internet presence is as essential for company success as having an email address. In fact, according to marketing industry website, AdWeek, 96% of small businesses have a Facebook page. The value of social media must be glaringly obvious to have that level of adoption. Just because social media marketing is demonstrably successful, however, doesn't mean business owners like it. Unfortunately, lots of Mom and Pop shops don't understand Internet marketing nearly as well as they understand their own business. They don't realize only having a social media channel, a Facebook page for example, is not enough for effective Internet marketing. They don't grasp that social media is only one element of a total online presence. In fairness, it's easy to see why entrepreneurs may despise social media. They may use it to keep up with their own family's news but don't see the value to a company. They hate to spend money to do something people do in their spare time for fun. Staff Facebooking and Tweeting are often activities business people are trying to discourage, so contracting out social media communications or paying an employee to do it seems terribly wasteful. The fact is, social media marketing is like sport fishing. A Facebook page is the flashy lure to get the attention of other Facebook customers but that page will rarely show up in a Google search. To land new customers, you also need a professional website to draw fresh contacts toward. Once there, converting visitors to customers is done with rich, persuasive, sales-friendly content, not possible on a single FB page. Using professional social media services in tandem with a great website is the modern way to attract and "hook" new clientele until you can add them to your "net" sales*. And the best part is, compared to most other old school marketing options like TV, radio and print ads, a website/social media combination is far less expensive and demonstrably more effective. a limited duration newspaper ad campaign. In reality, not only is the website/social media option less expensive than traditional marketing, your entire catalogue of products and services are available to a global audience 24/7, 365 days a year. TV, radio and print ads need luck to find their audience. Prospective customers may not be viewing or listening at the correct time or on the right channel to see the ad. As well, many customers may live outside your chosen medium's broadcast region. Additionally, not everyone takes the newspaper, listens to radio or watches TV anymore. These media have been steadily plummeting in the face of competition from entities such as Netflix, Spotify and YouTube. A website, however, with ongoing social media exposure changes everything. Instead of trying to find new customers, it makes it easy for new customers to find you. And that makes all the difference in the world. Don't just rely on half a job. To maximize your online marketing efforts a website to anchor your social media outreach is simply smart business. 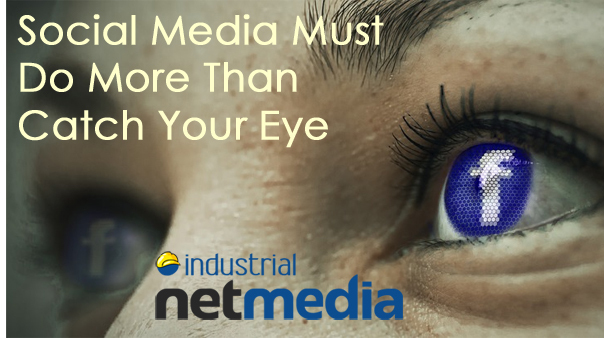 Trusting your Facebook page do more than catch your customers' eye will lead to disappointing results.